Today’s Share Your Style Friday is grazed by my blogging buddy Helene Adélé Abiola who runs Bon Vivant and a Budget, where she gives tips how to live large for less! And: she was the one who suggested to me to start sharing stylish pics from my readers! In this picture Helene has styled a dashiki dress quite fabulously with a dark blue cardigan, brown leather belt and green clutch plus brown leather boots. I love this look! 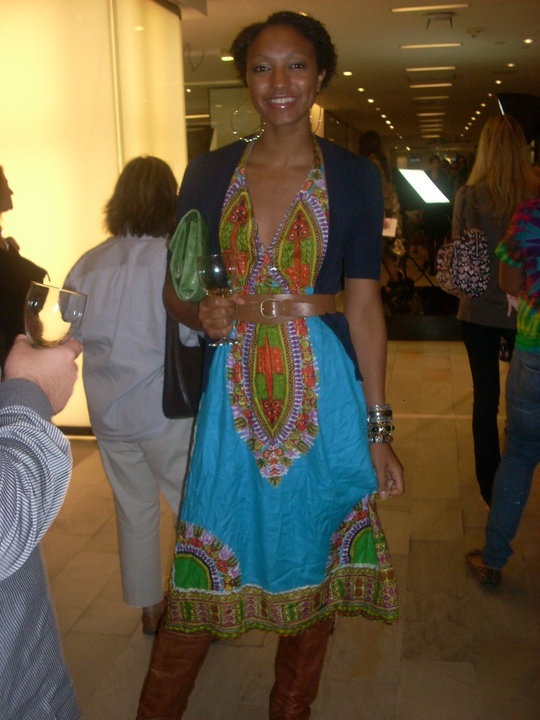 I would have never considered wearing a dashiki dress to an evening event – but now I will! How do you like Helene’s outfit? If you want to share your style send your picture to africanprintsinfashion@gmail.com !